Programmable robots are part of our every day life and our children are the future innovators that will be challenged to take robotics to the next level! The education system worldwide is evolving to incorporate robotics in the classroom so that students understand the fundamentals of this new technology while developing the necessary building and programming skills associated with robotics. At the same time, even at home, children are eager to experiment with robotics and integrate traditional play and fun with the electronics world which has overwhelmed their lives. 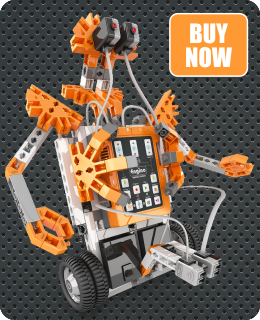 Engino Robotics Platform (ERP) is specially designed for Primary and Secondary level students and takes into account the most modern pedagogical principles of learning. With ERP intellectual development is approached as an upward expanding spiral in which children must constantly reconstruct the ideas formed at earlier levels with new, higher order concepts acquired at the next level. One of the key elements of any robotics system is the programming software. Engino has developed a special software that allows 4 different methods of programming depending on the user’s needs and capabilities. The robot can be programmed practically using the onboard membrane buttons. The program can be edited in the software and complex functions can be added. In addition, the ERP can be controlled from smart-phone devices as it has build in wi-fi module. Apps can be downloaded for free from Google Play and Apple store. 32-bit ARM CORTEX-M2 micro controller. 256 Kbytes FLASH, 64 Kbytes RAM. 7 input-output ports. They can connect up to 7 LED’s to teach traffic lights, up to 4 sensors digital or analogue and up to 3 motors (servo or analogue). 3 Motor output ports manually programmable for forward and reverse. 2 LED outputs manually programmable for ON-OFF. Power source: 6 AA batteries.